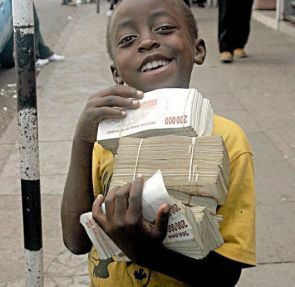 Zimbabwe is introducing a Z$100bn bill to circulation. 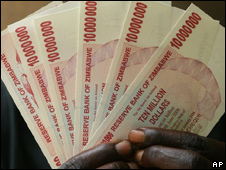 This does not cover one days worth of expenses (Z$500bn) for a person living in Zimbabwe (an unlucky sperm club member). Normally, this would be a terrible thing. However, rampant inflation is a fact of life in Zimbabwe and taken for granted. What the citizens don’t realize is the great lengths their government is going to in order to encourage math skills. For instance, calculating the cost of lunch (Z$100bn) for a week (multiply by 7) including inflation (estimated at 4,500% to 11,000%) requires seriously carrying some digits; the cost for a week is well into the trillions! Recommendation: Invest in human capital: smuggle waiters, cashiers, and other frequent handlers of cash out of Zimbabwe. These people will be able to mentally manipulate numbers of 13 or 14 digits quickly and accurately. Long or Short estimates that at current inflationary rates, these humans will be able to replace most semiconductors’ calculation power by the end of 2008. I went and did some fact-checking…who’d have guessed a kid would look so happy after selling his spleen? With inflation that high though, when do they measure the actual purchase price @ PoS? Is it when they start entering the price into the register, or when they finish? The difference could be substantial depending on how many items are being purchased, among other factors. make it rain tiny-baller, make it rain! That kid needs a silver metal briefcase! The kid’s just taking his pocket money of US$2 down to the sweet shop to buy 5 penny sweets. 6 if he runs! this kid would be wise to just hoard the money, surely it will be worth less than the paper its printed on on wait for it…3….2…1 jackpot! The sad thing about both your points is they’re very legitimate. Clearly we need to emulate their approach to monetary policy. The U.S. boasts approximately 500 billionaires while Zimbabwe has practically turn their entire nation into a nation of billionaires. I can only conclude that they must be doing something right. Strong of mind and strong of body the Zimbabweans will be. Besides awesome math skills, it takes a lot of physical strength to carry 80 pounds of cash to pay for your morning coffee down at the local cafe. The current inflation level is around 10 million percent. The link from 2007. I think the fun is over in Zimbabwe; the government is going to enact a summary revaluation of the currency. Sounds like that should address the underlying issues, right? I foresee a similar statement from Ben Bernanke at some future date, Fadi. Proving, once again, the international appeal of zimbabwenomics.